Thank you for the opportunity to discuss issues related to our ability to provide quality service and value to the American public. I will try to be very clear about the service the American people and Congress can expect, which is highly dependent on future funding levels. Before I begin, let me express my gratitude to you, Mr. Chairman and the Ranking Member, for signing the letter to the Budget Committee urging support for the President’s FY 2013 funding request for the Social Security Administration (SSA), including full funding for our program integrity efforts authorized by the Budget Control Act (BCA). Congress has expected us to manage our workloads successfully, with limited resources. In every fiscal year (FY) from 1994 through 2007, Congress appropriated less than the President requested. The agency did the best it could to meet expectations, but for the past 20 years, our workloads steadily increased. Requests for our core services have increased as the population grows, and baby boomers age and pass through their disability-prone years before retiring. To the extent that limited resources allowed, the agency hired and trained staff for these increased workloads and used technology to make traditional work processes more efficient. Even with these new and unavoidable demands, our innovative and proactive employees maintained high service levels for some time. Inevitably, though, increasing workloads combined with declining budgets damaged service delivery. Even with consistent year-over-year increases in employee productivity, our reduced staff could not keep up with the rising workloads. Throughout most of the past decade, the average time claimants waited for a disability hearing decision rose steadily, and in many locations, average wait times for a hearing exceeded 800, and even 900, days. Sadly, some claimants waited as long as 1,400 days—nearly four years—for a decision. We also dramatically cut the amount of program integrity work we did during these years despite the long-term harm to the trust funds. After the Senate confirmed me as Commissioner, I made the case that we needed to move in new directions and that Congress needed to provide the funding to support that shift. For FYs 2008- 2010, Congress provided funding at or above the requested level and in 2009, as part of the American Recovery and Reinvestment Act, provided us with additional funds to tackle our surging retirement and disability applications. This funding allowed us to reverse many negative trends, significantly improve service and stewardship efforts, and absorb huge increases in workloads due to the worst economic downturn since the Great Depression. We have dramatically lowered the average wait for a hearing decision, reversed the disturbing trend in program integrity work, and improved services agency-wide. We made remarkable progress. However, in FY 2011, while we received unprecedented new workloads, Congress cut our budget more deeply than in any year of the previous two decades. Congress also rescinded a sizable portion of our IT carryover funding, which is our best mechanism for improving productivity. With staff reductions caused by hiring freezes and attrition, our work force is contracting rapidly, field offices are consolidating, and we are struggling to maintain recent levels of service. When I leave office in 2013, the agency will have about the same number of employees that we had when I arrived in 2007, even though our workloads have increased dramatically. Since FY 2007, retirement and survivor claims have increased by 26 percent and disability claims have increased by over 31 percent. Before I describe the current state of our service delivery, our plans for improvement, and the difficult choices we have had to make under the current budget constraints, I want to briefly explain who we are and what we do, and our accomplishments with the funding you provided in FYs 2008 through 2010. We have just over 80,000 Federal and State employees who serve the public through a nationwide network of about 1,500 offices. Each day almost 182,000 people visit our field offices and more than 445,000 people call us for a variety of reasons – to file claims, ask questions, and change direct deposit information. During FY 2011, we paid nearly 60 million people over $770 billion in benefits. Specifically, we paid $591.5 billion in Old-Age and Survivor Insurance benefits, $128 billion in Disability Insurance (DI) benefits, and $52.4 billion in Supplemental Security Income (SSI) benefits. We strive to make timely and accurate payments and operate efficiently and effectively. Our administrative costs are only 1.6 percent of benefit payments. We have invested in IT and efficient business practices that have kept our overall costs down and allowed our employees to be more productive. • Balanced productivity with quality. In addition to our core program workloads, we handle lesser-known services that drive millions of Americans to visit our field offices or call us each year. For example, in FY 2011, we issued about 1 million replacement Medicare cards, and handled nearly 1 million transactions in administering the Medicare low-income subsidy program. We handle about 2 million requests each year from claimant representatives asking for information we maintain. About 65 percent of these requests are from representatives handling Social Security cases, but 35 percent are from representatives who request our information for insurance claims or other government programs. for other Federal agencies. Last year, we completed 1.4 billion verifications ranging from the EVerify program to health care programs, voter registration, drivers’ licenses, and many other government programs. While most of these verifications occur cheaply and automatically, a small but significant percentage of these interactions produce an increasing number of nonmatches that strain the resources of our rapidly shrinking field operations. In fact, if you look at our waiting rooms today, you see very few older Americans. You do see younger Americans, often with children, waiting for a document required by another agency for authentication purposes. 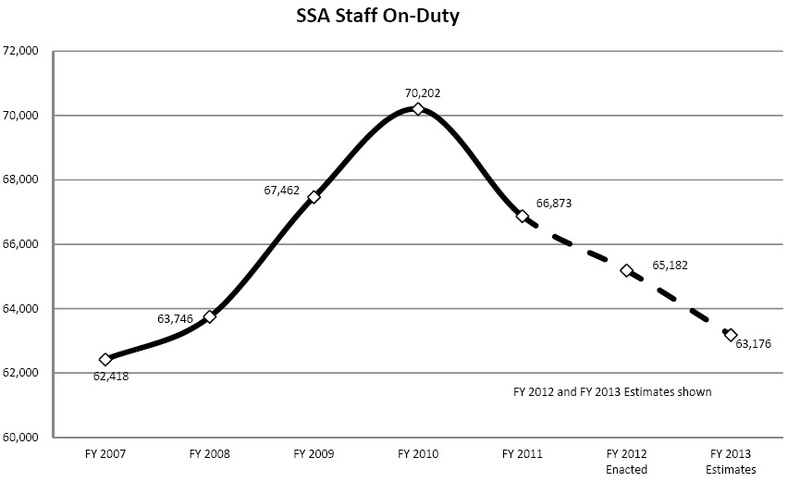 For example, the number of people coming into an SSA office for benefit verification has increased by 46 percent since FY 2007. I am proud of our organization and our accomplishments. We are committed to maintaining a strong level of performance on our core workloads and to working toward long-term improvement of our service to the public. When I became commissioner, Congress made it clear that eliminating the hearing backlog had to be our number one priority, and it remains our top priority. We have made incredible progress over the last 5 years. We cut the national average time disability claimants wait for a hearing decision by one-third, from an all-time high of 532 days in August 2008 to 354 days in April 2012. In 2007, some hearing offices had average waits of about 900 days; today the wait time in every hearing office is below 475 days. Our goal is to reach an average processing time of 270 days by the end of next fiscal year. When we made our commitment to eliminate the backlog in 2013, we focused on reducing the number of pending cases. However, we quickly recognized that pending cases as a measure of backlogs was a poor measure of performance, particularly in periods of rapid changes in unemployment. When persons request a hearing, they want to know how long it will take to get a decision. They are not interested in whether other people are waiting with them; rather, they want to know what will happen in their own individual cases. I compare it to a trip to the grocery store. When I go to the store, I do not care how many other people are there with me, or that the number of customers is increasing, unless that volume means that it takes me longer to navigate the store and check out. Like nearly all of us, I do not want to get bumped and jostled; I do not want to stand in line; and I am frustrated when there are not enough cashiers to handle the customers. With grocery stores, I can choose where I get my groceries and decide if I am willing to accept a particular store’s customer service. But Americans seeking Social Security benefits have only one place to go. With your help, we have greatly improved service for disability claimants— more efficient and timely decisions. For claimants, the most important metric is how long they have to wait for a hearing decision; consequently, our primary goal is now “average processing time” or APT, the average number of days it takes to get a hearing decision. Since overreliance on APT can produce perverse incentives, we balance that metric by focusing on “aged” cases and the average age of our pending requests for a hearing. APT is not a new concept; we have always recognized the importance of APT in measuring the success of backlog reduction. In fact, in 2007, we linked our pending goal to our goal for APT. When we established our target of reducing the number of pending hearings to 466,000, we based it on achieving the APT of 270 days, but we did not foresee the huge increase in filings. We have also focused on the oldest, and often most complex cases. Five years ago, we had over 63,000 people who waited over 1,000 days for a hearing, and some people waited as long as 1,400 days, which in my view is nothing short of a national scandal. Since 2007, we have decided over 600,000 of the oldest cases. We have done what few organizations like to do; each year we raise the bar by lowering the threshold for aged cases to ensure that we continue to eliminate the oldest cases first. We ended FY 2011 with virtually no cases over 775 days old. This year we are focusing on cases that are 725 days or older, and we have already completed 90 percent of them. In FY 2013 we will focus on cases 700 days or older. These improvements demonstrate that, with the right funding, we deliver. As I have mentioned, we also monitor the average age of pending (the number of days since a person filed an undecided claim) as an indicator of our productivity and efficiency. At the beginning of FY 2007, the average age of pending was 324 days. Today it is 209 days, a 35 percent decrease. 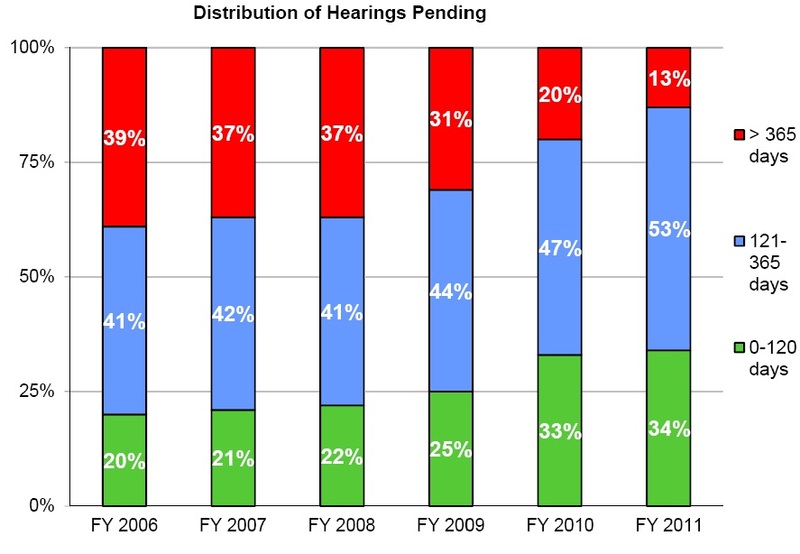 As the following chart shows, 39 percent of pending hearing requests were older than one year at the end of FY 2006. We reduced this to 13 percent at the end of FY 2011. To reduce the hearing backlog, we set an expectation for how many cases our administrative law judges (ALJs) should decide annually--between 500 and 700 cases. When we established that productivity expectation in late 2007, only 47 percent of the ALJs were achieving it. By the end of FY 2011, 77 percent met the expectation, and I thank them for their hard work. 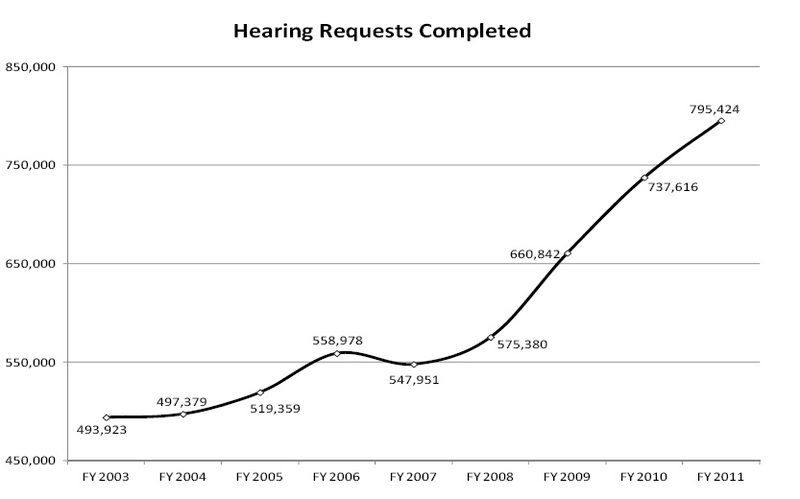 This improvement in productivity has helped us make progress despite the significant increase in requests for hearings. 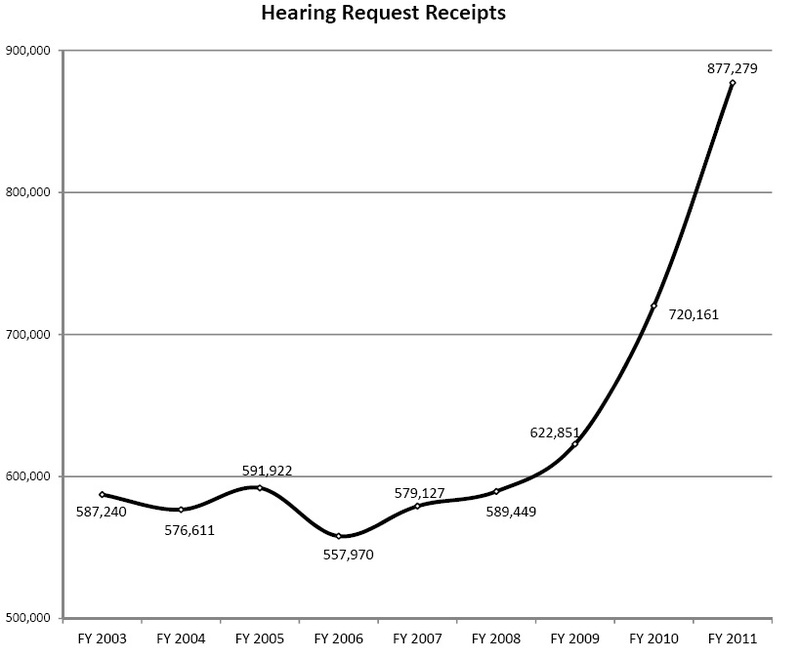 In FY 2011, we received about 877,000 hearing request, almost 157,000, or about 22 percent, more requests than we received in FY 2010. Let me be clear that our ALJs’ improved productivity has not resulted in more allowances. Our ALJs are not meeting our productivity goals by “paying down the backlog,” as has sometimes been alleged. In fact, our hearing level allowance rate dropped over 4 percentage points this past year. I do want to acknowledge that progress on backlog reduction has slowed in the last year, and we lost our margin for error when we cancelled eight planned hearing offices for budgetary reasons. We are doing what we can to compensate. We considered our success in holding down the number of initial disability claims pending and the average processing time as we saw a further spike in hearings requests. Accordingly, we decided to temporarily redirect our Federal disability units, which have been helping our State disability determination services (DDS), to instead help screen hearing requests for cases where they can make fully favorable decisions without the need for a hearing before an ALJ. We are hiring additional ALJs and using our reemployed annuitant authority to bring back experienced judges who have recently retired. We are maintaining a high support staff-to-ALJ ratio to ensure cases are ready to hear, and we are allowing the hearing offices to work overtime to try to keep up with surge in hearings. Nevertheless, we need your support and we need a timely and adequate supply of well-qualified judicial candidates from the Office of Personnel Management. We also need our projections for the number of initial claims and hearing requests to be met if we are to achieve our goal of an average processing time of 270 days by the end of next year. In addition to reducing the backlog of hearings, we are trying to keep pace with the rising number of new disability claims. 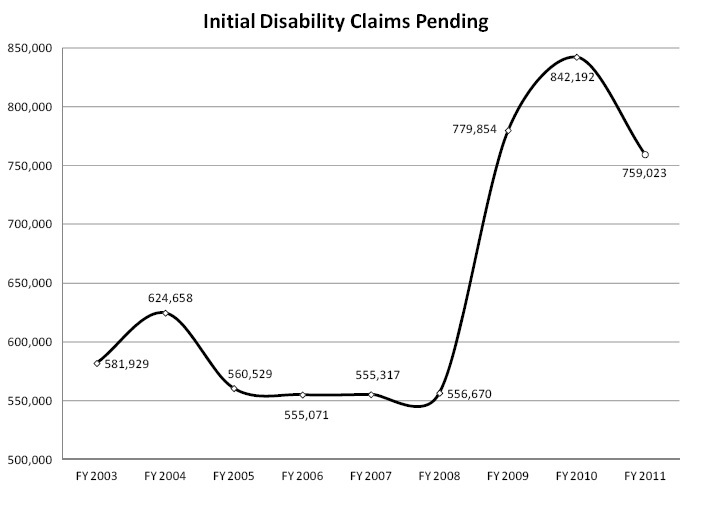 Since 2007, initial disability claims completed have increased by about 34 percent. Due to significant increases in employee productivity and policy improvements, we have so far been able to keep pace with this growing workload and do so while maintaining – and even improving – quality. 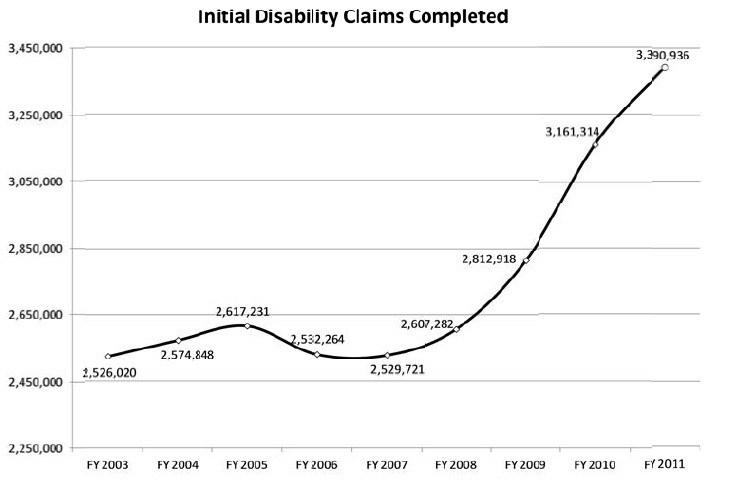 In FY 2011, we decided over 3,390,000 initial disability claims—a record number and nearly 230,000 more than in FY 2010. The funding we received in FYs 2008-2010 allowed us to hire new employees for the DDSs who make initial disability determinations. These new hires have been critical to our success. We have fully trained these new employees, and they are steadily becoming more proficient. In addition, we continue to make our disability processes more efficient. We have developed easier and more efficient online services to meet the Baby Boomers' expectations and keep pace with the high number of disability claims. Our easy-to-use online application, iClaim, has been a huge success. Disability applicants can now file for benefits online at their own pace and on their own schedule. The increase in online claims has also helped us deal with the additional economy-driven claims and reduce our field office waiting times. The percentage of applications filed online continues to increase. In FY 2011, more than one million Social Security Disability Insurance (SSDI) claimants (33 percent) filed online, almost seven times higher than in FY 2007, prior to iClaim. Through April 2012, 37 percent of SSDI claimants filed online. We continually identify ways to streamline the disability claims process. As of April 21, adults who file online now have the option of electronically signing and submitting their Authorization to Disclose Information to the Social Security Administration (Form SSA-827), the authorization form we use to obtain evidence. This improvement allows applicants to complete disability applications in an electronic, streamlined online session, rather than having to print, sign, and mail paper authorization forms to our local offices. Ultimately, we expect this improvement will further reduce processing times for initial decisions. We have focused other initiatives on quality. For example, we designed the Electronic Claims Analysis Tool (eCAT), a web-based application, to assist State DDS examiners throughout the sequential evaluation process. eCAT helps examiners document, analyze, and adjudicate critical aspects of disability claims consistent with our policy. eCAT uses “intelligent” pathing whereby user-selected options determine the subsequent questions and guidance presented. eCAT’s features, such as quality checks and quick links to relevant references, aid examiners in producing well-reasoned determinations. This documentation is particularly useful for future case review because it enables an independent reviewer to understand the examiner’s actions and conclusions throughout the development and adjudication of the claim. We expect every State to fully implement eCAT by September 30, 2012, which is a testament to our partnership with the DDSs. We continue to make significant progress in developing the Disability Case Processing System (DCPS). DCPS will replace the 54 different COBOL-based systems that support the DDSs with one national system based on state-of-the-art technology. This system will integrate case analysis tools and health information technology (health IT). It will allow us to disseminate policy changes faster, and it will improve consistency among the DDSs. It will save money because each time we need to modify our system, it will be one set of changes instead of 54 separate changes. We expect that the new system will improve processing times and decisional accuracy. We plan to begin testing the initial version of DCPS later this year. We are also working to incorporate health IT into our disability process. Health IT has the potential to revolutionize our disability determination process. We rely upon doctors, hospitals, and others in the healthcare field to timely provide the medical records that we need; we send more than 15 million requests for medical records annually. This largely paperbound workload is a very time-consuming part of the disability decision process. As the medical community moves toward electronic health records, we are pursuing an electronic system of requesting and receiving medical records. With the consent of our claimants, we will have near instantaneous access to their medical records. Health IT will dramatically improve the speed, accuracy, and efficiency of this process, thus reducing the cost of making a disability decision for both the medical community and the taxpayers. Once health IT becomes standard, our accuracy should improve significantly and we, along with Congress, will want to study changes to the disability process that build on this success. In addition to paradigm-shifting technology, streamlining and updating our business processes will also help us to decide claims more quickly without disadvantaging the claimant. For example, we recently allowed adjudicators to proceed to step five of the sequential evaluation process when we have insufficient information about a claimant’s past relevant work history to make the findings required at step four. In certain cases, if we find that a claimant is able to do other work based on his or her age, education, and residual functional capacity, we could deny the claim without determining whether the claimant is able to perform their specific past relevant work. This change should promote administrative efficiency and help us make more timely disability determinations. We are also successfully using Compassionate Allowances and Quick Disability Determination initiatives to fast-track disability determinations for over 150,000 disability claimants each year, while maintaining a very high accuracy rate. Currently about 6 percent of initial disability claims qualify for our fast-track processes, and we expect to increase that number as we add new conditions to our Compassionate Allowances program. Last month, in large part due to our highly productive partnership with the National Institutes of Health, we expanded our Compassionate Allowances program to include 52 additional conditions, which brings the total number of conditions in the expedited disability process to 165. Since we began our Compassionate Allowances program, we have quickly approved disability benefits for nearly 173,000 people with severe disabilities. Today, our DDSs make decisions in 10-14 days for people with these conditions, who might have previously waited years for a decision. Approving clearly eligible claimants early in the disability process benefits persons with severe disabilities and, at the same time, helps reduce our backlogs. We issued a new regulation that allows disability examiners to make fully favorable determinations on cases that qualify for our fast-track processes without requiring the examiner to consult with a medical professional. This change allows us to decide these claims even faster. To make consistent, better-informed decisions on whether disability claimants meet our disability criteria, we have started the difficult process of overhauling our main vocational tool, the Dictionary of Occupational Titles, which the Department of Labor largely stopped updating in the late 1970s. In FY 2009, we convened a panel of experts to guide us in the development of new occupational information. The panel’s work and research by agency staff have laid the groundwork for moving the project to the second phase, which involves collecting data on the relevant requirements of jobs in the national economy. We are discussing the best ways to collect the required data with our Federal partners, including the Department of Labor. We anticipate a FY 2013 pilot for data collection, which, if successful, will lead to the larger scale collection of data beginning in FY 2014. As a result of these and other enhancements, the State DDSs have increased their productivity. At the same time, the DDSs have steadily improved the accuracy of their determinations since FY 2007. These accomplishments are particularly remarkable considering the unwarranted furloughs of DDS employees in several States. These furloughs do not save the States money as SSA fully funds the DDSs. 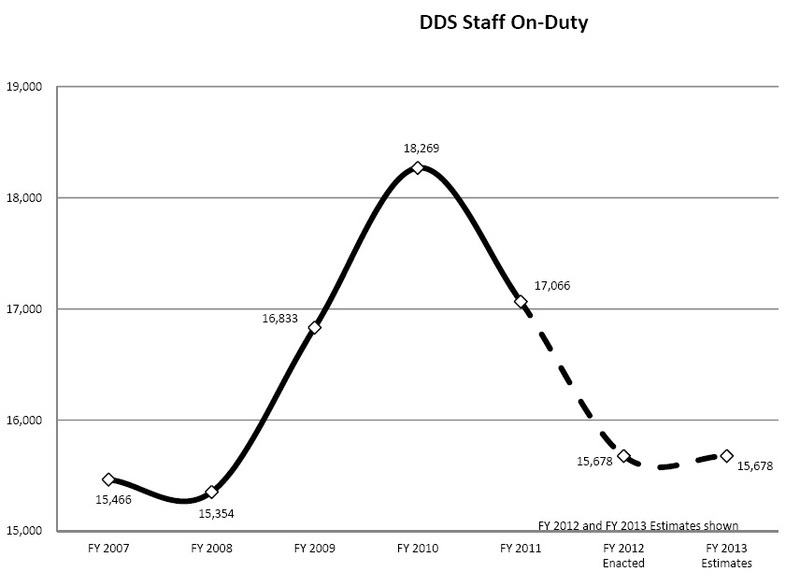 Since December 2008, DDS furloughs have resulted in over $55 million in delayed benefits. More information on DDS furloughs is available at www.ssa.gov/furloughs. We encourage you and your constituents to visit the site, and we are happy to work with you on this issue. Despite all our productivity gains and policy improvements, and even though we decided a record number of initial disability claims last year, we cannot continue to handle increasing disability claims without adequate funding. By the end of FY 2010, the number of pending initial disability cases rose to 842,192, a significant improvement over our earliest projections, but still a historically high level. By the end of FY 2011, we reduced the pending claims to 759,023. We are committed to protecting program dollars from waste, fraud, and abuse because preserving the public’s trust is an integral part of achieving our long-term goal to improve service. We pay nearly $70 billion in benefits each month to over 60 million beneficiaries; we have a duty to pay those benefits accurately and on a timely basis. Notwithstanding the complexity of our program, we have many tools to help us minimize improper payments. Many of these tools, like our medical continuing disability reviews (CDRs), which are periodic medical reevaluations to determine if beneficiaries are still disabled, and SSI redeterminations which are periodic reviews of non-medical factors of SSI eligibility such as income and resources, save billions of program dollars with a small investment of administrative resources. In each year since 2007, we have increased this cost-saving program integrity work. 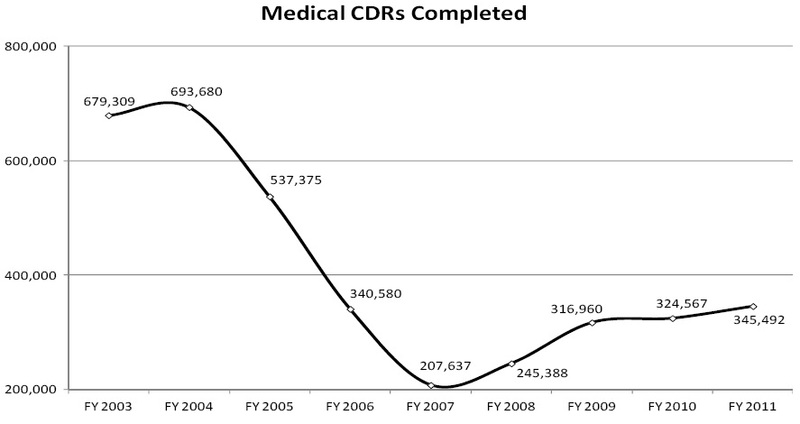 In FY 2011, we completed over 66 percent more DI and SSI medical CDRs than we did in 2007. For FY 2013, we estimate that every dollar spent on CDRs will yield about $9 in program savings over 10 years. Also, we have significantly increased the number of SSI childhood CDRs that we complete each year. In FY 2012, we expect to complete nearly 140 percent more of these cases than we did in FY 2011. 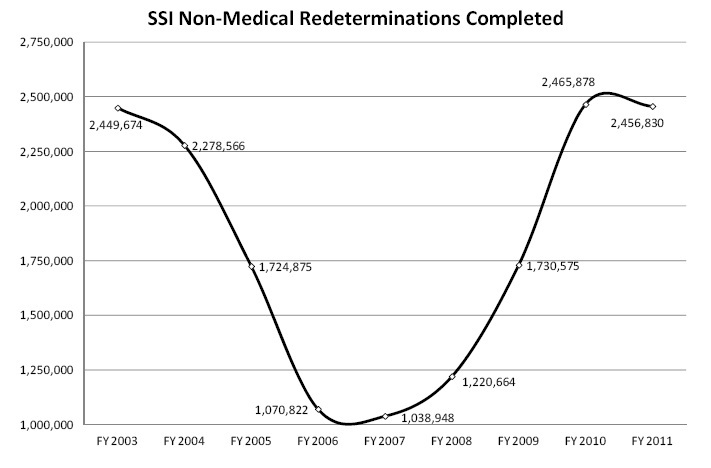 We also completed 1.4 million more SSI redeterminations in 2011, a 136 percent increase since 2007. The additional redeterminations helped us increase SSI overpayment payment accuracy for the second year in a row, with an estimated savings of about $6 for every dollar spent. Congress has appropriated less money for program integrity work in recent years than the President has requested. Given the substantial and proven return to the trust funds from our program integrity works, it is vital in these tough budget times that Congress supports the President’s recommendations for this important work. We are always looking for smarter ways to handle our work. We are expanding our successful Access to Financial Institutions (AFI) initiative that allows us to receive information about undisclosed bank accounts of SSI recipients and applicants. When AFI is fully implemented, we estimate it could provide up to $900 million in lifetime program savings each year. Building upon our AFI success, we are exploring the use of commercial databases to help us identify undisclosed non-home real property held by SSI applicants and recipients. This automated approach has the potential of helping us uncover unreported assets and improve the accuracy and integrity of the SSI program. The BCA authorized a level of program integrity funding that would have required that we complete 569,000 medical CDRs in FY 2012--a 65 percent increase over the FY 2011 CDR level. The Administration strongly supports the program integrity cap adjustments authorized by the BCA, which would put Social Security on a ten-year path to eliminate the backlog in program integrity reviews. Unfortunately, our FY 2012 appropriations did not provide the BCA level of funding for program integrity work; therefore, we can only complete 435,000 medical CDRs this year. The President's Budget requests $1 billion for SSA program integrity in FY 2013, which would allow us to complete the Budget Control Act levels of program integrity in FY 2013. While we have focused a lot of attention on the disability process, we have balanced our efforts to improve our other core services as well. Wait Times in Field Offices and On the Telephone --The sheer volume of work our employees handle is incredible. For instance, in FY 2011, more than 45 million people visited our field offices across the Nation. Despite the high volume of visitors, we reduced wait times in our field offices by more than 9 percent from FY 2010. We completed more than 62 million transactions over the telephone. Given the popularity and cost-effectiveness of this service channel, we are committed to improving our telephone service. Last year, callers to our 800 Number had the shortest wait time and lowest busy signal rates ever. 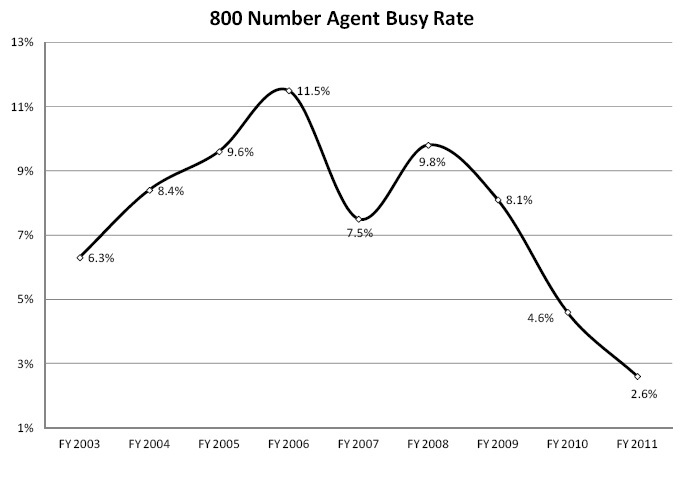 We reduced the time spent waiting for an agent by 45 percent, from 326 seconds in FY 2008 to 180 seconds in FY 2011. We cut our busy rate by over 70 percent since FY 2008. We attribute much of our improved performance to hiring additional teleservice representatives in FY 2009 and FY 2010, along with several technological advancements to make our 800-number more efficient. We are replacing our 800 Number telecommunications infrastructure with a new state-of-the-art system. This system will eliminate lengthy navigation menus that frustrate the public and distribute incoming calls across the network so callers can more quickly reach an agent. We know that reaching a busy signal is frustrating for callers, and we are considering how we can use the new system to address this issue. We expect the new system to be fully functional in FY 2013. We are also replacing the obsolete telephone system in our field offices. About 98 percent of field offices have this new system, and we plan to complete rollout in 2012. The new system has many helpful features, including a dynamic forward-on-busy service. This offers callers who would otherwise get a busy signal the option to transfer to our National 800 Number. With the new system’s call management capabilities, we reduced busy rates in field offices. The overall busy rate improved from 34 percent in FY 2010 to 12 percent in FY 2011. So far in FY 2012, the busy rate is 7 percent. However, as field office staffing decreases, the busy rate will increase. Online Services--I have already mentioned our very successful online application, iClaim. iClaim has not only helped with disability applications, but it has also helped us absorb most of the significant increase in retirement applications we received in the last few years. Through April 2012, about 42 percent of retirement applicants chose to file benefits online. The Internet has allowed us to create a vital service delivery channel that allows members of public to conduct business at their convenience and at their own pace, without the need to visit a field office. The availability of user-friendly online services is vital to good public service and our ability to keep up with the demand for our services. Without our online services, our field offices would be completely overwhelmed. We plan to expand and further improve iClaim and our other online services. We have recently implemented a new, more secure protocol to authenticate the identity of people who are interested in conducting business with us online through a new platform called “My SSA.” People who successfully authenticate will be able to verify their earnings history, receive notices, and request certain routine actions. The first service we implemented using the My SSA platform is the online Social Security Statement. In FY 2011, we suspended the paper Social Security Statements which cost nearly $70 million each year. Moreover, the traditional paper statement could possibly cost over a billion dollars over the next 10 years. Therefore, we developed a less costly, secure, and easy-to-use online Statement. Since its launch on May 1, more than 150,000 people have used it successfully. This new service provides all of the information paper Statements provide, but it also connects users to other useful information and services to help them plan for retirement. We will email users annual reminders to check their Statement for updated earnings and benefit information. The American public expects this type of online service. In fact, so far, most online Statement users have voluntarily opted out of receiving paper Statements in the future, which will help us achieve real savings. The $70 million we spend on printing and postage costs for mailed Statements equates to about 750 employees, who could complete 85,000 initial disability claims or conduct 70,000 continuing disability reviews. For now, we continue to mail Statements on request to people who cannot use the online service. In February 2012, we resumed mailing Statements to workers nearing retirement age (age 60 and older), and later this year, we will begin mailing Statements to workers who turn age 25 to make them aware of our program, services, and the importance of saving. agency to provide many major online services in Spanish. In fact at a hearing last Wednesday before the House Subcommittee on Social Security, Mr. Larry Freed, President and CEO of ForeSee Results, Inc., commented that six of our nine online services had an ACSI score above 80, which is generally considered the threshold for excellence. He also made the point that three of our online services (iClaim, Retirement Estimator and Help with Medicare Prescription Drug Plan Costs) outperformed or tied Amazon, the highest-scoring e-retail website in history. In addition to providing better service to the public, our online services also save time for our employees, which allows them work on more complicated issues. Our internal studies indicate that the service provided over the Internet is as high in quality as that provided in office or over the phone. These easy-to-use online tools continue to increase the usage of our online services. Without our move to online services, we would have experienced serious new backlogs and other services failures around the agency. Video Services--Our increased use of video service has efficiently provided relief to many busy and understaffed offices. In addition, through video services, we are able to reach members of the public in remote sites such as American Indian Tribal centers, local community centers, senior centers, hospitals, and homeless shelters. I also want to mention our Representative Video Project (RVP). We initiated this project in 2008 as part of our overall effort to increase the number of video hearings and thus decrease our ALJs’ time spent traveling. It allows representatives to purchase their own video conferencing equipment and then conduct hearings from their own offices. Particularly for claimants and representatives in less populated areas, this new service channel provides substantial benefits. Our FY 2012 funding is about $1 billion less than the President’s request. We had to make hard cuts because we are operating with about $400 million less than we had in FY 2010. Based on this funding level, we expect to lose over 2,500-3,000 employees in FY 2012 and over 2,000 more in FY 2013 even with the President’s Budget request. These losses are in addition to the more than 4,000 employees we already lost in FY 2011 – a total loss of more than 9,000 Federal and State employees in just three years. With the hiring freeze in FY 2011 and only limited critical hiring in FY 2012, our recent levels of performance will be short-lived unless Congress accepts the President’s recommendation for FY 2013. The current reduced level of funding is forcing us to choose which of our important workloads to prioritize and which core workloads we must delay. Trained employees are our most critical resource. Even as we vigorously pursue automation, the nature of our work remains labor-intensive and thus dependent on having the necessary number of trained staff. The same employees who maintain our stewardship responsibilities must also handle applications for benefits, so without sufficient resources and trained staff we cannot keep up with both service improvements and our important program integrity work. Regardless of our technology improvements, under current funding we project that our 800- number service will deteriorate significantly because we will not have a sufficient number of people to answer calls. We expect that busy signals will rise from 3 percent in FY 2011 to 6 percent in FY 2012. 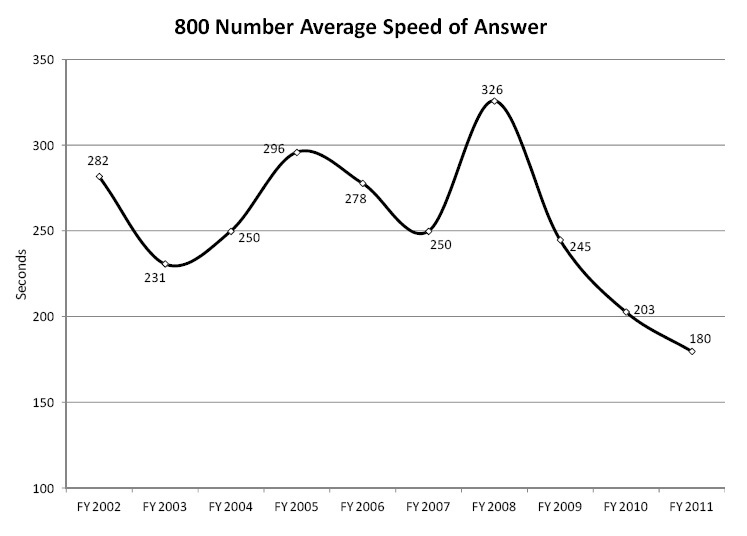 Our average speed of answer will increase from 180 seconds in FY 2011 to 285 seconds in FY 2012. Overall service also will deteriorate in our field offices and processing centers because staffing losses do not happen evenly across the country. This year alone, nearly one-third of our field offices have experience more than 10 percent attrition, and 15 offices have lost over 30 percent of their staff. For example, I recently visited our Springfield, Massachusetts office, and the waiting room was filled to capacity. The office has lost 11 employees, 19 percent of its staff, in the last few years. We are doing what we can to assist this office, including implementing a video connection with another office, but few offices have excess capacity to help. As another example, our Butte, Montana office has lost three of its employees over the last few years, and five of the six remaining employees are eligible for retirement. We cannot maintain our extensive network of local field offices if we do not have enough employees to staff these offices. We are unable to complete all of our important post-entitlement work, the work that we do after a person comes onto our rolls. For example, we will have to delay some overpayment actions, representative payee actions, and SSI status changes that can affect payment amounts, such as a change in living arrangement. This year we estimate that we will be unable to get to about 3,800 workyears of these types of actions because we do not have enough staff to complete all of the work we receive. Our inability to handle this work timely could result in improper payments and delay collecting overpayments. • We suspended the some of our lower priority notices (for example, recontact notices and direct deposit). • We significantly reduced overtime, which we had relied on to offset our inability to hire replacement staff. We closed field offices to the public 30 minutes early each day to allow our employees to complete late day interviews without using overtime, and we are considering earlier closures next year due to fewer staff and no overtime. • Our field and hearing office employees stopped visiting remote service sites to save travel time and costs. • We decided not to open eight needed new hearings offices and a new teleservice center last year. • In FY 2011, we also suspended the paper Social Security Statements because they cost nearly $70 million each year. We must also consolidate our field offices, which is always controversial but unavoidable given reductions below the President’s recommended appropriation. Although we appreciate the interest in having one of our offices in every community, we have to react to fiscal realities that mean we cannot continue doing business as we always have. Consolidation saves a significant amount of money on rent and overhead costs. We estimate that each office consolidation save us about $1.2 million over 5 years. In FY 2011, we consolidated 11 offices, and in FY 2012 to date we have consolidated 12 offices and have plans to consolidate 11 more offices. Let me assure you that we do not make these decisions lightly – we analyze a number of factors to ensure that the service we deliver meets the needs of the service area. Among the factors we consider are the proximity of other offices, the service area population, employee attrition and lease timeframes. The recent budget cuts affect our resources for IT investments. As a result of earlier funding, we were able to add protection for our critical IT infrastructure, which supports all of our programs. Consequently, we now have a fully functioning second computer center that serves as a backup and complement to our National Computer Center. Further, last month we finally had the groundbreaking ceremony for the state-of-the-art replacement for our fraying National Computer Center, which will be built for about $75 million less than the original estimated cost. In FY 2001, facing severe budgetary constraints and recognizing the important role technology investments have in our service delivery, Congress included in that year’s appropriations bill a provision that made funds that were not obligated at the end of the FY available in future years for information technology initiatives. Congress has continued to provide this authority in every succeeding appropriations act. In the FY 2011 budget, however, Congress rescinded $275 million from our IT no-year funding. We have put these funds to good use. This authority has allowed us to make technology improvements that help our employees work more efficiently. Our IT investments have helped us achieve an average of average annual employee productivity increases about 4 percent. The ability to use prior year resources has helped us fund important projects such as making our disability process fully electronic, developing more robust and user-friendly online services, and opening our second data center. By reducing our IT carry-over funds in FY 2011, our agency was unable to invest in new IT projects which could have improved productivity and accuracy. For FY 2013, we are requesting $11.76 billion for our administrative expenses, a modest increase from FY 2012. Our FY 2013 budget request is lean. We have already curbed lower priority activities so that we can continue to achieve two of our most important goals – eliminating the hearings backlog and focusing on program integrity work. Full funding of the FY 2013 President’s budget also includes funding to resume the mailing of Social Security Statements to 158 million eligible workers. While we will achieve goals associated with these priorities, we simply cannot do all of the other work we are required to do. I urge Congress to appropriate this level of funding because we have proven that we deliver. Through the hard work of our employees and technological advancements, we have increased employee productivity by an average of about 4 percent in each of the last 5 years, a remarkable achievement that very few organizations—public or private—can match. To improve program integrity and stewardship, the President’s FY 2013 budget includes three legislative proposals that have the potential to reduce program overpayments by testing programmatic simplification, by giving us access to important State, local government, and private insurer benefit information, and by getting more timely information about wages. The first proposal is the Work Incentives Simplification Pilot (WISP). WISP could address a significant disincentive to work under the current disability insurance rules: the fear of losing benefits due to work activity. The current set of work incentive policies and post-entitlement procedures are very complex and have become very difficult for the public to understand and for us to effectively administer. The goal of WISP is to conduct a test of simplified program work rules, subject to rigorous evaluation protocols, that may encourage beneficiaries to work and reduce our administrative costs. The second proposal would require State and local governments and private insurers that administer worker’s compensation (WC) and public disability benefit (PDB) plans to provide us with information on WC and PDB payments. By requiring plan administrators to provide payment information to us promptly, this proposal would improve the integrity of the WC and PDB reporting process, improve the accuracy of SSDI and SSI payments, and lessen our reliance on the beneficiary to report this information in a timely manner. The third proposal would require employers to report wages quarterly. Increasing the timeliness of wage reporting would provide us more current information on our beneficiaries’ work activity, which could help to minimize the amount of overpayments. Reverting to more frequent wage reporting would enhance program integrity not only for Social Security but also in a variety of other programs. This proposal is an important action you could take to resolve inaccurate payments. Thank you for this opportunity to explain what wonderful work the men and women of the Social Security Administration are doing under enormous stress, and why we need your support to continue to serve the American people in the way that you and I expect. I am proud of the hard-earned progress we have made over the past five years. We fully recognize that we all must tighten our belts, and therefore have examined which services, though important, we must discontinue. I want to be candid with you that we will continue cut services as funding requires, even though I know these decisions are unpopular. The work we receive is not optional. At some point, we will have to handle every claim that comes to us, every change of address, every direct deposit change, every workers’ compensation change, every request for new or replacement Social Security cards. The longer it takes us to get to this work, the more it costs to do. Funding us to keep up with the work is ultimately cheaper than delaying it. It is also the moral thing to do for the American citizens who depend on our services. No matter what Congress decides, our employees will continue to do their best to serve the public with a smile, even as that public misdirects its frustration at our frontline employees. Our employees will keep thinking of new ideas like AFI to help us better serve the taxpayer. We will also keep improving online services that are necessary to handle our ever-increasing work. I look forward to a constructive dialogue with you regarding how we can provide the best possible service and stewardship is this difficult fiscal climate. Service Online is number 7.
h indicator and parents’ names. 2 All statutes enacted after October 28, 2009, must also cite to 5 U.S.C. 552(b)(3) in order to withhold information from the public.